Just a quick reminder for all you last-minute shoppers — Kindle and Nook editions of Decisions and The Globe are still on sale for only 99¢ each. Donovan Grant lost his mind, his wife, and his career. Now he may be losing even more. Lately, and with distressing regularity, he’s been finding himself standing over dead people while holding the murder weapon. Even worse, he’s his own prime suspect. And that new woman in his life? She may be next on his list . . . that’s if he’s not on hers. The Globe—38,500 tons of ocean plying opulence housing in its fabulous apartments some of the wealthiest people on the planet. Reynard Chevalier—The Globe’s security officer. An expatriate American with a new name, a new country, a new life, and a past that is rapidly catching up and threatening to destroy him. Staff Captain Katarina Giordano—Reynard’s boss during the day, his lover at night. Jane Hanover—The Globe’s latest resident. The fiancée from Reynard’s previous life. The woman who has sent Reynard’s past careening on a collision course toward his all too vulnerable present. Charles Hanover, III—Jane’s philandering husband. A man who rationalizes his infidelities by demanding that his wife also find solace outside their marriage. Security Officer Sarah Brighton—Reynard’s amorous Number 2. A woman too young for Reynard and too determined to accept no for an answer. Sterling Heyward—The Globe’s reclusive owner and Reynard’s best friend and employer. A man whose enormous wealth was built spilling the blood of others. The Globe Slasher—A sadistic sociopath with a very large chef’s knife and an insatiable blood lust for the rich and beautiful. A serial killer who has reached into the distant past to find inspiration for his perverse grotesqueries. Louis Guignard—The French police captain. A man stationed in Saint Barts, hundreds of miles from The Globe. A man walking Reynard through his investigation via a very tenuous internet connection. A man who knows that it is only matter of time before the Globe Slasher turns on the one person aboard The Globe who can stop the slayings—Reynard Chevalier. 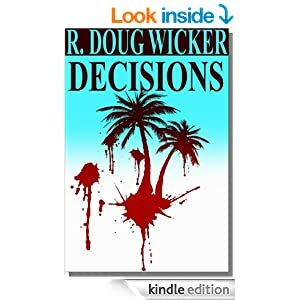 R. Doug Wicker is a witty, talented, entertaining writer with a knack for interesting plot twists and dialogue that snaps, crackles, and pops. With his captive-audience setting and an entertaining cast of characters that keeps you guessing, and then guessing again, the author’s latest novel, The Globe, becomes at once a funny, intriguing, serious, and at times even compelling novel. Better still, it’s a fast-paced read that ends much too quickly and leaves you hoping for a sequel, or maybe even a couple of sequels. Mr. Wicker is particularly adept in his descriptions and understanding of modern firearms, which is something that is often missing in current crime fiction. I found myself placing a bookmark next to the author’s name, where I’ll be waiting to sample his next offering of escapist fare. In a word, Bravo.–William Florence, author of the Max Blake Western series and Max Blake Mystery series. The most underrated book I read in 2012 is The Globe by R. Doug Wicker. It’s underrated because it’s not selling particularly well, but should be. It’s a great read. You know when you read a certain book, you just know the author is extremely smart and you would like to have a beer with him? I feel that way about R. Doug Wicker, whom I’ve never met or communicated with, but would like to. The Globe is a cruise ship, but not any ordinary one. It’s actually a floating condominium, and each cabin has a wealthy owner. Murders take place, and Reynard Chevalier, the erudite security officer must solve them. I love those murder mysteries that take place in a closed environment (the locked room conundrum popularized by Agatha Christie – think Ten Little Indians – and others). There’s a finite number of potential victims and suspects. Reynard is inexperienced as a murder investigator, and the number of plot twists tests his abilities. Wicker handles all this cleverly with great deftness and an elegant writing style. You’ll be glad you discovered this delightful gem of a book. Five out of five stars.–RW Bennet, author of Suicide Squeeze and Love.com. Don’t Buy Decisions Just Yet — Let’s Make It a REAL Sale! Since Amazon decided to place Decisions on sale, I decided to go a step further. I just revised the Barnes & Noble Nook and Amazon Kindle prices for both Decisions and The Globe to an astoundingly low 99¢. It may take several hours for the new prices to be posted on Amazon and Barnes & Noble, so wait until the reduced price is effective before making your purchase of these two exciting murder mysteries. A few words of warning — The Globe deals with seriously adult themes in a sometimes very graphic manner, so it’s not for the squeamish and definitely not appropriate for youngsters; Decisions is light-hearted fun with a lot of humor, but the language can get a bit rough in places. Both titles are available for all Amazon Kindle markets, which in addition to the United States include the United Kingdom, Germany, France, Spain, Italy, the Netherlands, Japan, Brazil, Canada, Mexico, Australia, and India. For the Barnes & Noble Nook, market availability includes the United States and the European Union (including pricing in the British Pound). Comments Off on Don’t Buy Decisions Just Yet — Let’s Make It a REAL Sale! Amazon appears to have put my Publishers Weekly reviewed novel Decisions on sale to $2.99 from its listed price of $4.49. Don’t ask me why or for how long, but if you order it now for you Kindle or Kindle-enabled device you’ll save $1.50.